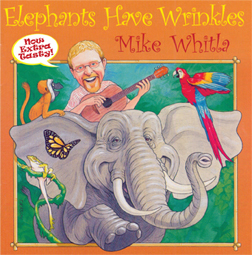 Elephants Have Wrinkles is the first recording from award-winning childrens’ entertainer Mike Whitla. Orignally released in 2000, this current version was re-released with 5 new songs in 2007. This lively recording features songs familiar and new that will thrill young and old alike. A bit about Mike: Mike Whitla is the pied piper of the toddler set. He spends most of his time singing with children. Mike is the founder and director of Rainbow Songs, which runs participatory music programs throughout Metropolitan Toronto for families with kids from birth through 6 years. Mike is also an award winning childrens’ musician, composer, producer, and teacher drawing on idioms including jazz, classical, Indian, Latin-American, folk, and popular styles.